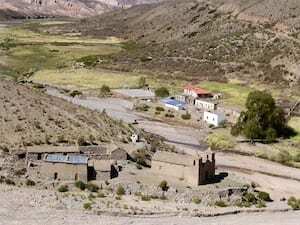 The town of Quebrada Honda as it appeared in 2007. The fossil site of Quebrada Honda is located in the far south of Bolivia, about 40 miles (60 km) southwest of the city of Tarija. It sits at an elevation of about 11,500 feet (3,500 m) in the Eastern Cordillera of the Andes, the mountains that form the eastern border the Altiplano. The fossil-preserving rocks at the site were deposited roughly 13-12 million years ago, during the latter half of the middle Miocene. A wide variety of fossil animals have been discovered at Quebrada Honda, including more than 30 species of mammals and several types of reptiles and birds. Many of the mammal fossil specimens are very well preserved and provide a great deal of information about the anatomy of these species. 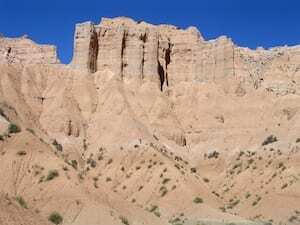 In addition, the ancient soils (paleosols) at the site preserve a diversity of ichnofossils including traces of roots, small burrows, nesting chambers of bees and wasps, and brood balls of dung beetles. Our team has been studying these specimens and conducting a variety of other types of analyses to better understand the environment and habitat of this ancient ecosystem. For a detailed (but accessible) discussion of this site, check out our Quebrada Honda Story Map. 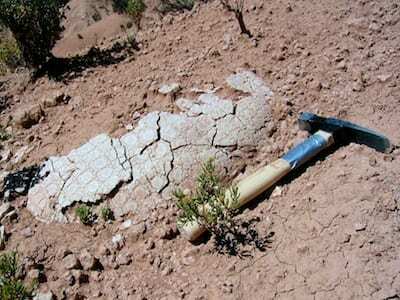 Exposures of the fossil-bearing beds of the Honda Group exposed near the town of Quebrada Honda. Quebrada Honda is a very important paleontological site for several reasons. For one, it documents a time interval that is poorly represented in South America’s fossil record. It is one of only a handful of sites of its age and one of only two where the remains of many species have been identified. The other well-known site of this age, La Venta, is located in the extreme north of the continent (Colombia), and nearly all the mammal species that have been discovered there are different from those at Quebrada Honda. Thus, both of these sites provide unique information about the mammals and other animals that were living in South America in the late middle Miocene. A primary question our team is trying to answer is why the mammal faunas of these two sites are so distinct. One possible explanation is that some geographic barrier prevented the exchange of animals between the two areas. A large wetland covered much of the South American tropics (Neotropics) at the time, and this could have resulted in dramatically different mammal faunas in the northern and central parts of the continent. Another possible explanation is that the two sites harbored different species because they had very different climates and habitats. Our studies of the ancient soils and soil-dwelling animals of the site indicate that different climates and habitats were probably an important contributing factor. 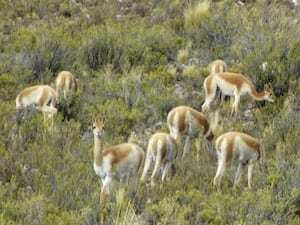 Vicuñas (wild relatives of llamas and alpacas) feeding in the low brush typical of high elevation habitats in Bolivia. Yet another reason we are so interested in the ancient environment of Quebrada Honda is because it can provide insights about its paleoelevation: how high it was when its fossils were deposited. The Andes are a relatively young mountain chain, and plant fossils and other data indicate that most of the area’s uplift occurred within the past 20 million years. (It was at sea level when the dinosaurs went extinct 66 million years ago). Determining precisely when and how this uplift occurred – whether it occurred gradually or in “spurts” – is vital for creating accurate computer models of past and future climate. Recent isotopic data from Quebrada Honda suggest that it sat at a higher elevation during the middle Miocene than Denver, Colorado does today (at least 6,500 feet or 2 km), perhaps much higher (nearly 10,000 feet or 3 km). However, our team’s discovery of giant tortoise fossils and fossils of an aquatic turtle there suggest it was likely much lower, less than one-third that high (3, 200 feet or 1,000 m). This interpretation has been supported by the diversity of mammals and other animals we have found at the site in addition to our reconstruction of its climate and habitat. 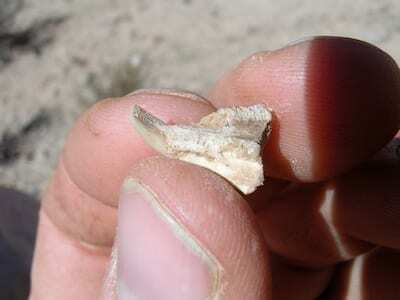 The lower jaw of the tiny rodent Acarechimys, preserving both incisors (left) and several cheek teeth (still covered by sediment). Articulated limb bones of a macraucheniid litoptern, an extinct type of hoofed mammal that had llama-like proportions. Partial shell (carapace) of a glyptodont, an extinct tortoise-like relative of modern armadillos. Cadena, E.A., Anaya, F. & D.A. Croft. 2015. Giant fossil tortoise and freshwater chelid turtle remains from the middle Miocene, Quebrada Honda, Bolivia: evidence for lower paleoelevations for the southern Altiplano. Journal of South American Earth Sciences 64:190-198. Catena, A.M., D.I. Hembree, B.Z. Saylor, F. Anaya & D.A. Croft. 2017. Paleosol and ichnofossil evidence for significant Neotropical habitat variation during the late middle Miocene (Serravallian). Palaeogeography, Palaeoclimatology, Palaeoecology 487:381-398. Croft, D.A., J.M.H. Chick & F. Anaya. 2011. New middle Miocene caviomorph rodents from Quebrada Honda, Bolivia. Journal of Mammalian Evolution 18:245-268. Croft, D.A. 2007. The middle Miocene (Laventan) Quebrada Honda Fauna, southern Bolivia, and a description of its notoungulates. Palaeontology 50:277-303. Engelman, R.K. & D.A. Croft. 2014. A new small-bodied sparassodont (Mammalia: Metatheria) from the middle Miocene locality of Quebrada Honda, Bolivia. Journal of Vertebrate Paleontology 34(3):672-688. Engelman, R.K., F. Anaya & D.A. Croft. 2015. New specimens of Acyon myctoderos (Metatheria, Sparassodonta) from Quebrada Honda, Bolivia. Ameghiniana 52(2):204-225. Engelman, R.K., F. Anaya & D.A. Croft. 2017. New palaeothentid marsupials (Paucituberculata) from the middle Miocene of Quebrada Honda, Bolivia, and their implications for the palaeoecology, decline and extinction of the Palaeothentoidea. Journal of Systematic Palaeontology 15: 787-820. Forasiepi, A. M., M. R. Sánchez-Villagra, F. J. Goin, M. Takai, N. Shigehara, and R. F. Kay. 2006. A new species of Hathliacynidae (Metatheria, Sparassodonta) from the middle Miocene of Quebrada Honda, Bolivia. Journal of Vertebrate Paleontology 26:670-684. Frailey, C. D. 1987. The Miocene vertebrates of Quebrada Honda, Bolivia. Part I. Astrapotheria. Occasional Papers of the Museum of Natural History, The University of Kansas 122:1-15. Frailey, C. D. 1988. The Miocene vertebrates of Quebrada Honda, Bolivia. Part II. Edentata. Occasional Papers of the Museum of Natural History, The University of Kansas 123:1-13. Garzione, C.N., D.J. Auerbach, J. J-S. Smith, J.J. Rosario, B.H. Passey, T.E. Jordan & J.M. Eiler. 2014. Clumped isotope evidence for diachronous surface cooling of the Altiplano and pulsed surface uplift of the Central Andes. Earth and Planetary Science Letters 393:173-181. Goin, F. J., M. R. Sánchez-Villagra, R. F. Kay, F. Anaya-Daza, and M. Takai. 2003. New palaeothentid marsupial from the middle Miocene of Bolivia. Palaeontology 46:307-315. Hoffstetter, R. 1977. Un gisement de mammifères miocènes à Quebrada Honda (Sud Bolivien). Comptes Rendus de l’Académie des Sciences, Paris, Série D 284:1517-1520. MacFadden, B. J., and R. G. Wolff. 1981. Geological investigations of Late Cenozoic vertebrate-bearing deposits in southern Bolivia. Anais do II Congresso Latino-Americano de Paleontología 2:765-778. MacFadden, B.J., F. Anaya, H. Perez, C.W. Naeser, P.K. Zeitler & K E. Campbell, Jr. 1990. Late Cenozoic paleomagnetism and chronology of Andean basins of Bolivia: evidence for possible oroclinal bending. Journal of Geology 98:541-555. McGrath, A.J., F. Anaya & D.A. Croft. 2018. Two new macraucheniids (Mammalia: Litopterna) from the late middle Miocene (Laventan South American Land Mammal Age) of Quebrada Honda, Bolivia. Journal of Vertebrate Paleontology 38(3):e1461632. Pujos, F., G. De Iuliis & B. M. Quispe. 2011. Hiskatherium saintandrei, gen. et sp. nov.: an unusual sloth from the Laventan of Quebrada Honda (Bolivia) and an overview of middle Miocene, small megatherioids. Journal of Vertebrate Paleontology 31(5): 1131-1149. Pujos, F., G. De Iuliis, B.M. Quispe & R.A. Flores. 2014. Lakukullus anatisrostratus, gen. et sp. nov., a new massive nothrotheriid sloth (Xenarthra, Pilosa) from the middle Miocene of Bolivia. 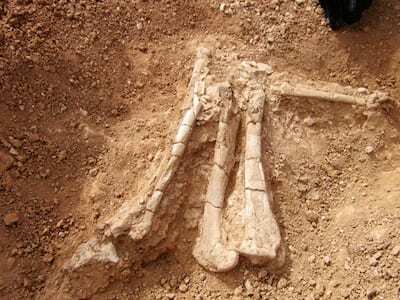 Journal of Vertebrate Paleontology 34:1243-1248. Sánchez-Villagra, M. R., R. F. Kay, and F. Anaya-Daza. 2000. Cranial anatomy and palaeobiology of the Miocene marsupial Hondalagus altiplanensis and a phylogeny of argyrolagids. Palaeontology 43:287-301. Villarroel, C., and L. G. Marshall. 1988. A new argyrolagoid (Mammalia: Marsupialia) from the middle Miocene of Bolivia. Journal of Paleontology 62:463-467.